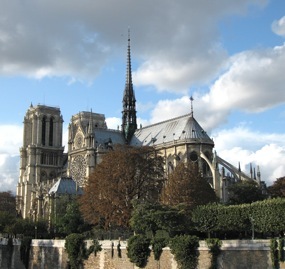 For all its history, it is the art and architecture of Notre-Dame that will awe and delight you. You'll pass the church many times. Drop in! For more than eight centuries, the Gothic majesty of Paris's Cathedral of Notre-Dame has dominated the Seine from its perch on the Île de la Cité. On April 15, 2019, during extensive renovations, a disastrous fire broke out in the cathedral, destroying the roof, the spire, and much of the interior. The two great towers still stand, but you will not be able to visit this unique monument for years. 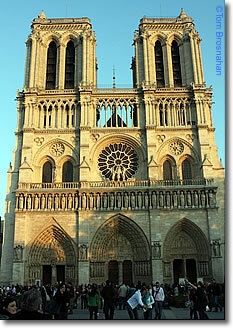 Begun in 1160 and finished a century and a half later, Notre Dame also dominates the ecclesiastical history of Paris. The kings of France sat in splendor here to be crowned by the bishop of Paris in this hallowed sanctuary. Napoleon was different: he seized the crown from the bishop's hands and placed it on his own head, symbolizing his self-reliant achievement. Built in an age of illiteracy, Bible stories are everywhere, carved into the portals, painted on the altars, and emblazoned in the glorious stained glass windows. Above: An unmistakable landmark: La Cathédrale de Notre-Dame, Paris, before the disastrous fire. Below: Back view of Notre-Dame, seen from the Left Bank.